All the Things You Are tells the story of Natasha, a young Jewish woman living in New York. Following a broken engagement, she falls in love with Rafi, an architect working on her grandmother’s social club, who also just happens to be from a Palestinian family. I’ve long been fascinated by the Jewish faith, and for a while I’ve been looking for a non-fiction book that will help me understand all the customs, traditions and history that come with being a Jew. Having read All the Things You Are, I’ve realised that the best way to understand the faith may be to read books like this, novels that are focused on Jewish families. I certainly do not know as much as I should about the historical conflicts surrounding Israel, and even though this novel hasn’t made everything clear, it has certainly encouraged me to seek out more information and read more about it. As much as I enjoy standard chick-lit books, sometimes I find myself looking for something more in a book. 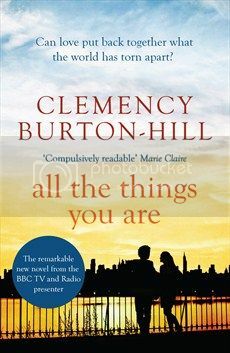 All the Things You Are has, at its heart, a romance, and yet it is so much more than just a boy-meets-girl kind of a story. Natasha and Rafi fall in love in New York, where, at first, she assumes that he must be Jewish. It’s not clear why she assumes this; maybe it’s just because her Holocaust-surviving grandmother has employed him as an architect, or maybe it’s the way he looks. When she finds out that his grandparents were forcibly removed from Jerusalem as children, it doesn’t affect her feelings for him, but she does feel a sense of guilt at the way that he is treated in Jerusalem, when, as a Jew, she is able to visit the city without anyone questioning why she is there. The title speaks to the fact that who you are is made up of so many things; Rafi spends a lot of time telling Natasha that he doesn’t want to try and take on any of the resentment that she seems to want him to feel over the injustice that his parents suffered. For her part, she can’t help but feel a sense of guilt, just because she is Jewish, even though she of course had nothing to do with it. When the action moves, halfway through the book, from New York to Jerusalem, these issues become even more heightened, with Natasha meeting Rafi’s family and friends, and the political and historical issues really come to the forefront. For me, the most fascinating character in the book is Natasha’s grandmother, Esther, and it’s a shame that there isn’t really enough room within the story to focus more on her. She’s very much in the background, providing a reason for Natasha and Rafi to be brought together, and book-ending the novel with her work, but it would have been nice to learn more about her. Perhaps there’s a whole other novel waiting to be written about her tragic past. She says that New York saved her life, and I would love to read more about that. Although I felt that things got tidied up almost a little too neatly at the end, I did enjoy All the Things You Are; it was an interesting story about a romance that has to transcend tribes, proving that even in this day and age, sometimes love has to try very hard before it is able to conquer all.